Well, it should have been the crack of dawn, but dawn is at 3AM here. So although we got up at 6AM, the sun was high in the sky. Having driven through Leeds and been somewhat traumatized, we wanted to get an early start before the Manchester traffic got really bad. We ate in the room and were in the car by 7AM. Take a look at the pictures we took of Chester Cathedral. Henry II (and Eleanor)- Lion in Winter (Richard and John are their sons). Henry III- Son of John (I don't have access to the internet, so I think this is right). So whenever I've heard any history of King Edward I, it's always been about his campaigns in Wales and Scotland and his castle building. Actually they always make it sound like, "And then one day, he just ran mad and started building castles all over Wales. After reading my share of placards today, this is what I've learned. The other really interesting detail was where he put the castles. Gwynedd is evidently the bread basket of Wales. It has the only land that will grow grain. So it has always been the wealthier area of Wales. That was how the Kings of Gwynedd, notably Llywelyn the Great, managed to convince the other petty Kings in Wales that they were really the King of all Wales. So all those castles in Wales built by Edward are in Gwynedd or are guarding Gwynedd, because that gave him control of the breadbasket of Wales. Really, talking about the castles is just easier if I can show you what I'm talking about. 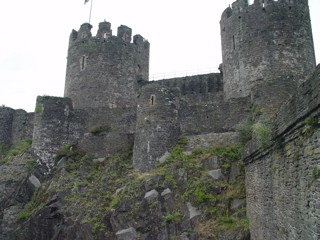 So here, just click over to the various castles we visited. Tonight I'm sitting and typing in a 16th century manor house. It's called Gwydir Castle near Llanrwst. (That's in Wales.) The grounds are just gorgeous. About 10 acres of gardens. We are now so far north that it is only just now dark at 10:30 pm. It was light as day at 9:30, which was the time it was starting to get dark in London. The place is a little unsettling. I can feel the weight of all the people who have lived here. Lonely cries of the peacocks out in the garden. A house that I'm sure saw joys and sorrows in its many years. The four-poster bed in my room is a curtained shut-bed, and the room has a small fire place in it. The gothic windows overlook the roof and the guard house. Through the sculpted trees in the garden I could see the mountain pass that we drove through to get here. Purple sky with mist and clouds covering the tops of the mountains. Brilliant green grass and trees. Yellow fields of harvested grain beyond the garden fences. Not a restful place, but one to savor and roll around on the tongue. Pictures of Gwydir tomorrow, you'll have to make do with the castles and cathedral photos above.